The Block, Redfern, has been described as the "Black Heart" of Australia and occupies a unique place within Sydney's urban landscape as a centre for the Indigenous community. The suburb was once a strong working class neighbourhood and was the starting point for the 1917 general strike for a shorter working week - but in the 1980s the rail yards were closed down and have now been transformed into a new cultural centre, CarriageWorks. Redfern grabbed headlines in 2004 after riots erupted when a 17 year old Aboriginal boy died as he was chased by police cars on his push-bike. In that same year the Redfern/Waterloo Authority was established - a special government committee to oversee the rapid development and gentrification of the area. 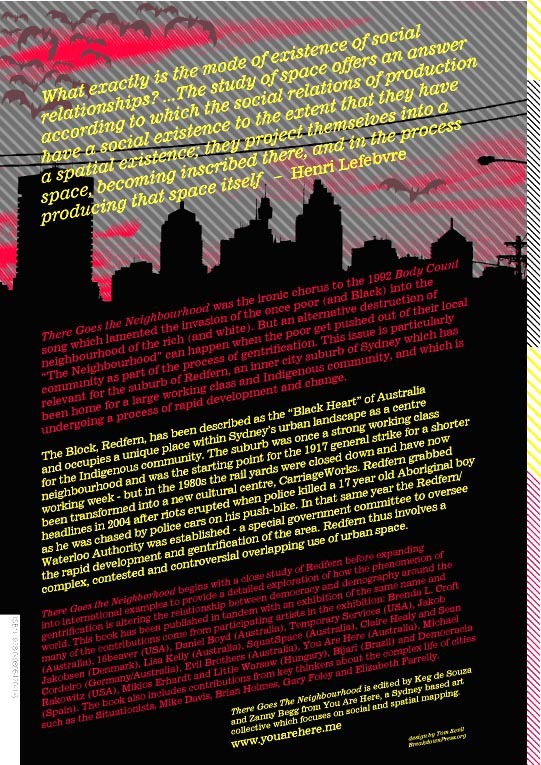 Redfern thus involves a complex, contested and controversial overlapping use of urban space. 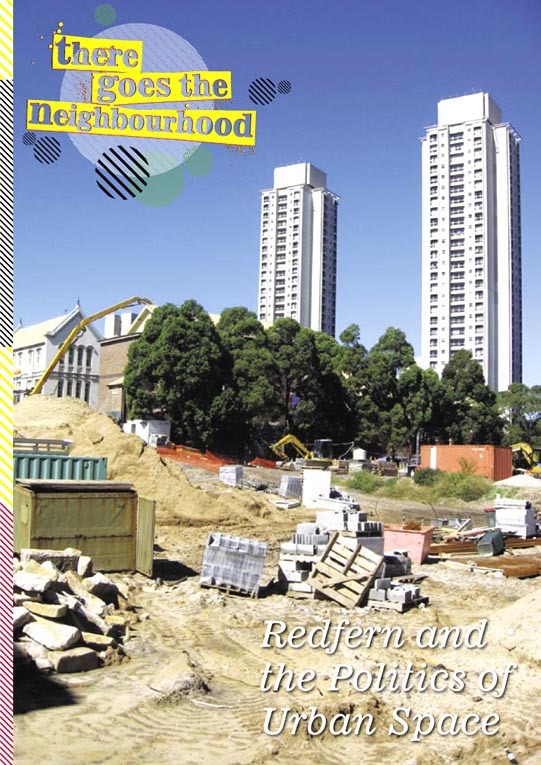 There Goes the Neighborhood begins with a close study of Redfern before expanding into international examples to provide a detailed exploration of how the phenomenon of gentrification is altering the relationship between democracy and demography around the world. This book has been published in tandem with an exhibition of the same name and many of the contributions come from participating artists in the exhibition: Brenda L. Croft (Australia), 16beaver (USA), Daniel Boyd (Australia), Temporary Services (USA), Jakob Jakobsen (Denmark), Lisa Kelly (Australia), SquatSpace (Australia), Claire Healy and Sean Cordeiro (Germany/Australia), Evil Brothers (Australia), You Are Here (Australia), Michael Rakowitz (USA), Miklos Erhardt and Little Warsaw (Hungary), Bijari (Brazil) and Democracia (Spain). The book also includes contributions from key thinkers about the complex life of cities such as the Situationists, Mike Davis, Brian Holmes, Gary Foley and Elizabeth Farrelly. There Goes The Neighbourhood is edited by Keg de Souza and Zanny Begg from You Are Here, a Sydney based art collective which focuses on social and spatial mapping. To download a PDF of the book click here.